This week we have a Guest Review from Emma and Anthony from @themeparkcouple (on Twitter and Instagram) about their Disney Wedding and how they planned it. They are a 'just married' couple in their late 20s from South Wales UK and they love everything about Florida like WDW, Universal Orlando Resort and all the other theme parks. 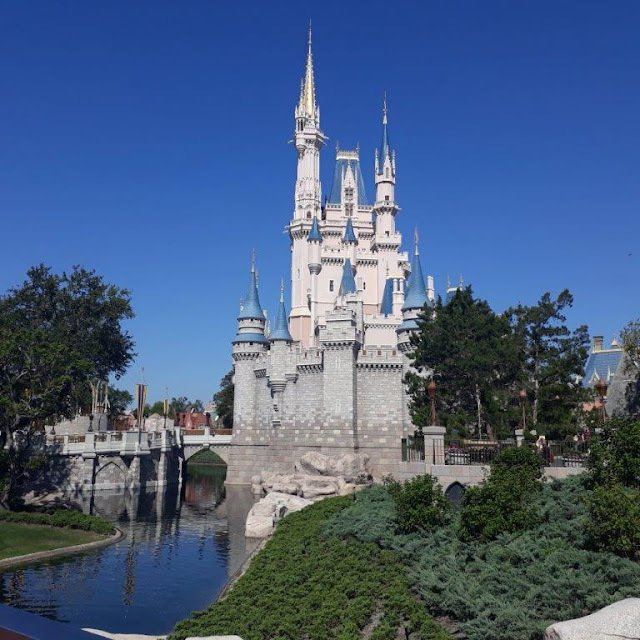 Emma details what planning is required to get married at Disney World, the different Wedding Packages, the Song choices, the Cake and the 'Park Shoot' and what it is like to be in the park outside of normal operating hours! In this article we are going to tell you about our most magical day spent on Disney property -our wedding day. We are lucky enough to be able to tell people that we got married at the most magical place on Earth, the Wedding Pavilion at Disney’s Grand Floridian Resort & Spa. We are from the UK so logistically it was hard work. We always realised that not all of our family members or our friends would be able to make it, but we sat down and decided there was no where else we could possibly get married and it was what we always wanted so we went for it. It turned out to be the best decision ever! If you are having a similar issue then please do it for yourselves - its the most amazing experience! Being from the UK we did think there would be a lot of issues trying to plan a wedding nearly 5,000 miles away and to be honest I knew I would find it difficult as its the most important day of our lives and I wanted it to be perfect. We have to say Disney are there every step of the way and are always on the end of the phone or just an email away. There are 3 different packages to cater for guest numbers and budgets; Memories is a wedding package that caters for smaller intimate weddings, so this equates to the bride and groom and 2 guests. The next option is the Escape package which is for up to 20 guests including the bride and groom and the final option is Wishes which has no limits and you can have what ever your heart (and budget) desires. We chose the Escape package which includes; a choice of venue, flowers for the bride, buttonhole for the groom, up to 2 hrs of photography and a 20 print jasmine album. For the ceremony you get a organist and a violinist and you get the violinist for the cake and champagne celebration, a choice of 4 styles of 2 tier cakes and 4 hour limo charter. Now with all of this you can upgrade your choices and add additional services. Our only addition to the package that to be honest was a no brainer was a park shoot at Magic Kingdom. I do regret not having the Cinderella carriage but at $US 2,500 our budget just couldn’t stretch that far but if yours can it is something you should really think about although the price has recently gone up to $US 3,500, but apart from that everything was perfect! From the start the coordinator was amazing, she was so helpful, friendly and made us feel special. Depending on when you would like your wedding with the Escape package you can only book the date 8 months prior to the date you would like, we luckily got both dates we wanted which were the 15th May for the wedding and 20th May for our park shoot. We first had Michelle who sorted out booking the dates and finding out a bit about us as a couple and what we were looking for. Once you have the dates booked you get another coordinator, we had the wonderful Chrissy, she was amazing and couldn’t have asked for anyone better. She understood that being from the UK it was difficult going into a day that we really knew nothing about which is, to be honest an odd experience but it becomes one big brilliantly organised surprise. Chrissy was always reassuring us and was always available throughout the wedding day if we ever had any questions or concerns about anything but she was so good and professional we had total faith in her. About 2 months before your big day they ask you about your song choices and this was particular hard for us as we both love all Disney songs and didn’t want it to be cheesy but we wanted it to be special and mean something to us so after going back and forth between songs we finally got our 4 songs. We decided on the “Imperial March” from Star Wars for Anthony, I know a weird choice for a wedding but it was funny seeing people’s faces and we love Star Wars plus Anthony is 6 ft 5 so he was embracing his inner Dave Prowse. My bridesmaid Jamie walked down to “When You Wish Upon a Star” from Pinocchio and as it was Cinderella themed I walked down to “A Dream is a Wish Your Heart Makes”. After the ceremony we walked out to “Once Upon a Dream” from Sleeping Beauty. Finally for the cake and champagne our entrance was to “So This is Love” from Cinderella it all sounded so beautiful and really put the icing on the cake so to speak for the day. As we were getting married at 12 I had to be there by half 11 and Anthony was about 30 mins before that (although we ran a little behind schedule and Anthony did panic for a bit, thank God for Jonny the Best Man keeping him as relaxed as possible) the limo came to our villa outside of Disney property to pick us up. We were greeted by Chrissy after our short ride and also by our amazing photographer Jacob which we couldn’t recommend enough he was so fun and helped us relax by making us laugh and he just took the most amazing pictures. My bridesmaid and I were put into the holding room which is stunning which has a “special” mirror inside. This is where Rev Kevin Knox introduced himself, he was so lovely and couldn’t have asked for a more perfect man to marry us. Once the ceremony was over we had family photos in the pavilion, at that point our guests were escorted over to the reception room in the convention centre while we had our photos taken in and around the pavilion. After photographer Jacob got our “good side” (still looking for Anthony's) we got taken over to our reception by our driver Marc who by the way is great fun and someone we happened to bump into a week later and he remembered us so we had a little catch up. The cake looked fantastic and tasted just as good as it looked, there was so much of it too, we picked to have a chocolate cake with white chocolate filling. The violinist was playing Disney music of course, but he did ask if we wanted anything else so we all just picked random songs and he was incredible he could literally play anything such was his talent, we threw so many different songs at him and he just kept on playing. I wish I could remember his name so you could request him! At the end of the reception we had to talk to Jacob about the park shoot as he was going to be doing that also. The park shoot is a must and really think that if a Disney wedding is what you're dreaming of this is worth that extra cost because on balance to us it was worth every last cent. When you have a park shoot you have to be at a location given to you by the photographer more than 2hrs before the park opens. We had to meet him at The Grand Floridian as our shoot was taking place in Magic Kingdom. Getting entry into Magic Kingdom that early was a treat in itself as we got to see parts of the park only staff get to see and it’s seriously quite when there’s not another 100,000 people in the same location. When you have photos around the park you get to pick from 3 routes we picked route 2 which started at Cinderella's Castle and then went to Gaston’s and Be Our Guest, it normally includes the Little Mermaid but as we wanted to do some photos around the Carousel we chose to do that instead, if like us you’re lucky enough you may have the park all to yourself which made it all the more exciting and special although it was such a surreal feeling walking around with no one else there but us and a few workers, it was the most amazing experience and will never forget it as long as we live. Everything was so incredible we could have asked for anything better, if you have any questions or just want to know more we are more than happy to help in any way we can just email us as we know how daunting and scary this process is and we want you to enjoy the process as much as we did. Many thanks to Emma and Anthony for sharing their special day with us.